Four Wheatland Center School students were re-cently awarded and recognized in the regional Scho-lastic Art and Writing Awards competition. Caleb Bruley, an eighth-grader, earned two Gold Keys in writing and will advanced to the national panel of judges in New York City. From left: Bruley, Brynn Wierzbicki, Breanna Moe and Madeline Chambers (Submitted/The Report). 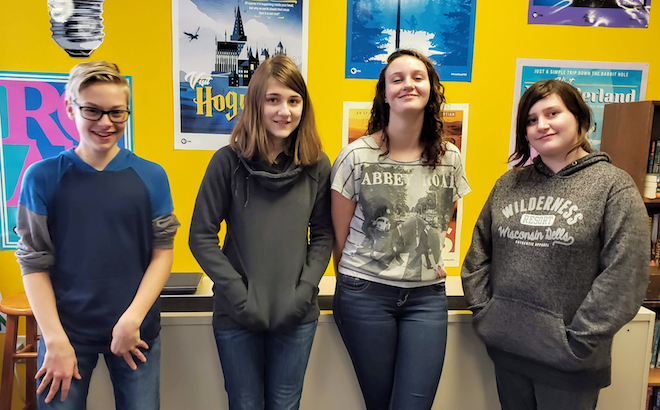 Caleb Bruley, along with three other Wheatland Center School students, garnered recognition for their pieces presented at the regional Scholastic Art and Writing Award competition. Joining Bruley, an eight-grader, were Brynn Wierzbicki, Breanna Moe and Madeline. Bruley earned two Gold Keys in short story and humor for his piece “The True Untold Story About Chad the Garbage Man”, which has advanced to New York City to the national panel of judges. Chambers earned a Silver Key for her short story “The Murder Mystery”, and Breanna Moe earned a Silver Key for her personal essay/memoir “Broken Girl”. Additionally, Wierzbicki, in the art competition, received honorable mention for her drawing/illustration “Red Fox.” She will be recognized at a Feb. 9 awards ceremony at the Milwaukee Art Museum, host of the Wisconsin Scholastic Art Awards since 1975. There are three levels of recognition in the regional awards: the Gold Key, which is the highest award, followed by Silver Key and Honorable Mention awards. Entries receiving Gold Keys advance to New York for national judging by professional writers, editors, publishers, and educators, while Gold Key and Silver Key works are included in a published collection or exhibition of regional award-winning work. For additional information, please see artandwriting.org.